On April 23, the English celebrated their patron saint, St. George, Christian nobleman and alleged dragon slayer. 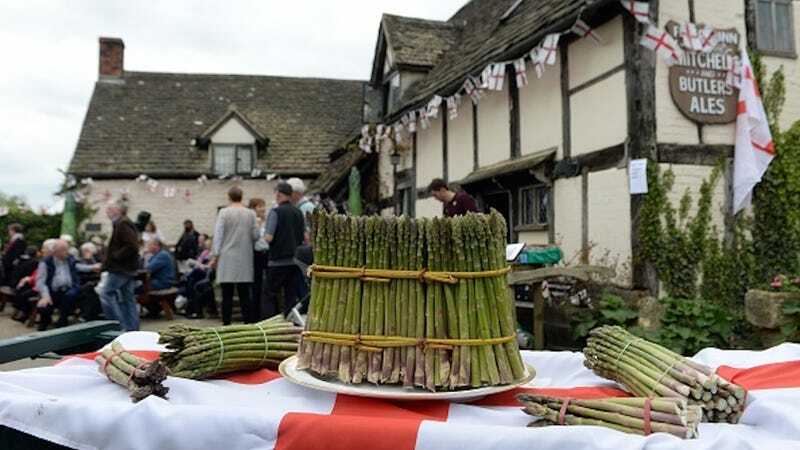 And on that same day, Worcestershire kicked off its annual Asparagus Festival. To honor the occasion, the crop was blessed in Worcester Cathedral with much fanfare. According to Atlas Obscura, the ceremony included a solemn, if peculiar procession. Behind a member of the clergy walked a man in suit and tie holding a bundle of asparagus. Then, Gus the Asparagus—a man costumed as the vegetable who serves as the festival’s mascot—followed. A fourth gentleman dressed at St. George brought up the rear. Once at the front of the church, the cathedral’s Precentor issued a blessing in honor of the crop. Check out Gus, that pious asparagus stalk, bowing his leafy head in devotion. By the way, should you care to read more about Saint George, you can do that here. And if you’d like to hop across the pond to attend the 2017 Asparagus Festival, here is their official website. May Gus bless you and keep you.